Wonderful! Great illustration for the poem, and you really caught the eye. Thank you! I really miss birds. It’s so nice to have a little more time now. I love Mary Oliver, and plan to do more of this kind of post. I’m so glad you like it. Hey and the Mets are looking good so far! Nats in the basement! Yes we’ll take the good news while we can. It’s a long season. Thank you! I miss wildlife and nature art, it’s probably what I enjoy most. Wow! Powerful words and art combined today, Laura. I love it. And the hawk – those eyes! You are so gifted in doing eyes to just draw me in. The intensity of those eyes held me breathless for a moment or two. I don’t recall how I first found you, but I remember the first post of yours I saw – it was R is for Racoon – and I’ve been hooked since :). Happy 4/15! Are you doing the dance?! Thanks so much! I’ll be doing lots more realism, wildlife and portraits specifically, now that crazy time is winding down. Totally dancing, yes!! I remember you commenting on my raven way back in January. It seems like a lifetime ago! I love the raccoon; he’s one of my favorites. Oh my gosh, this is beautiful. Your drawing is so realistic, and you picked a striking poem to draw for. Thanks so much. Realism and wildlife have taken a back seat to work demands, but they’ll be coming back now. I’m so glad you enjoyed both. I just love Mary Oliver’s work. You do have a way with birds! Beautiful. Beautiful post! The bird is striking! A beautiful piece of art for a lovely poem! 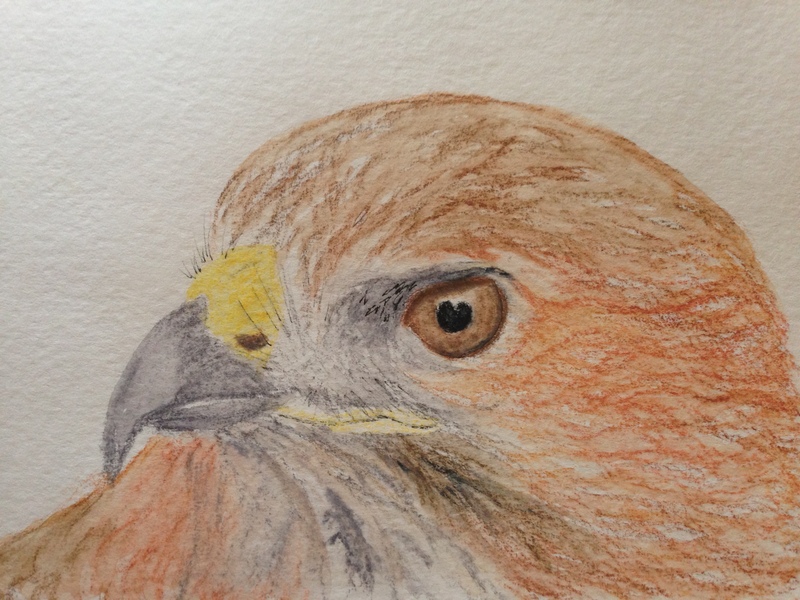 Awesome job on drawing the hawk’s head! Thanks, Teresa! This was non-Inktense watercolor pencil (not sure if you’re curious about the difference). Gorgeous hawk portrait :-). To repeat Kirkistan’s words: that eye! I’d never read that poem by Mary Oliver before. I like the contrast between the free flying bird and the immobile stone. Thank you so much! Yes, she is amazing. It’s a pleasure to quote her work. I’d like to start drawing things based on what inspires me from a work of poetry. Makes the alphabet more interesting and fun! Thanks, T! It’s nice to be drawing birds again. Really like having your artwork complement the poem! Thanks! I’m so awed by Mary Oliver’s work. She always inspires me. Her love of the wild infuses everything. I hope to spotlight many of her works here. A friend recommended Oliver’s poetry to me several years ago. She writes a good deal about nature, especially birds! I think it’s why I’ve loved her stuff for so long. I feel always like I’m right with her in her awe of nature….and how she verbalized it is amazing to me. Dumbfounding, at times. Glad to see you’re also a fan! Beautiful work, Laura. The drawing goes very well with the Oliver poem.